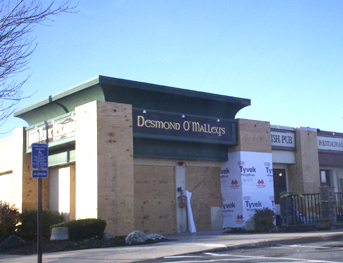 I was thinking about how I haven’ been to Desmond O’Malley’s in about a year. For some reason I always forget it’s even there. This morning I drove by and saw they were doing construction/renovation there and did a little investigating. Looks like it will be unveiled sometime this month as the Metro 9 Steakhouse, still owned by Desmond O’Malley’s. A fine dining experience awaits our patrons in an upscale, sophisticated setting located on Rte 9 in Framingham, MA. Metro 9 will serve affordable, high quality steaks, chops and fresh seafood ranging from $16 to $26. With our November 2006 opening, we are now seeking quality-minded individuals ready to provide the best dining experience in a professional manner to our customers. Sounds interesting if the food and service is as good as it seems it should be. Probably not a place I’d go to all the time but I’ll definitely check it out.